For sale is a 15 gallon electric brewing setup, modeled after Kal's design several years ago. I'm a fairly meticulous and detail oriented engineer, so construction quality should be very good for the most part. The front of the control panel was cut on a water jet from a CAD model and the bottom was cut with the nice Greenlee punches. The pots are 15.5 gallon and the fermenter is 7 gallon. Comes with mash tun and lots of assorted stainless fittings and silicone hoses. Comes with the table. It's to the point where I have heated water with it, but I ended up moving houses when I was 95% done and haven't had time to get back to brewing, and hence have not gotten all of the finishing touches complete. I would estimate it could be up and running in a Saturday if you were motivated. The control panel is functional and I would say the rest of it is ~95+ percent done. 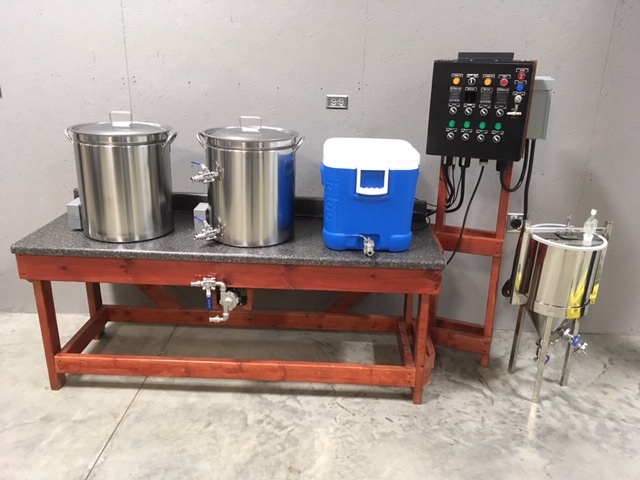 From what I remember, the counterflow chiller needs a compression fitting, the pots need something to sit them on so they don't burn the table top. I robbed one of the PID controllers from it for another project, but I'll be glad to buy and install a new one if we reach an agreement on the sale. I would like to get $2500 out of this but feel free to make me an offer. Would be willing to sell the fermenter separately for $200 but would like to keep the rest together. Located near Peoria, IL. If you don't get any biters on the whole system i might be interested in the panel only. unfortunately i have all of the other equipment so i have no need for it. Ok, I'll keep that in mind. I would prefer to sell everything together.